Sister Jean Dolores Schmidt, 98, was a trending topic on Twitter last week. She’s the most talked-about person in the NCAA March Madness tournament, and early Tuesday morning, she appeared on the news show Good Morning America. “I’m just having a lot of fun and it seemed to mushroom all of a sudden,” she said on the show. Sister Jean said on the show that multiple people across the country reached out to her including students she taught decades ago. “It just brought so many happy memories to me and I’m really happy to be saying good morning to all of America today,” she said. Many Loyolans view the nun as an icon, and now she is becoming a self-proclaimed international sensation. Sister Jean has been the men’s basketball team’s chaplain since 1996 and offers prayers, advice and analysis to players before and after games. The team has advanced to the Sweet Sixteen off two, back-to-back wins during the NCAA March Madness tournament. She taught for 30 years in Mundelein College until it became affiliated with Loyola in 1991, The PHOENIX previously reported. The PHOENIX collected some students’ favorite memories for her 97th birthday. 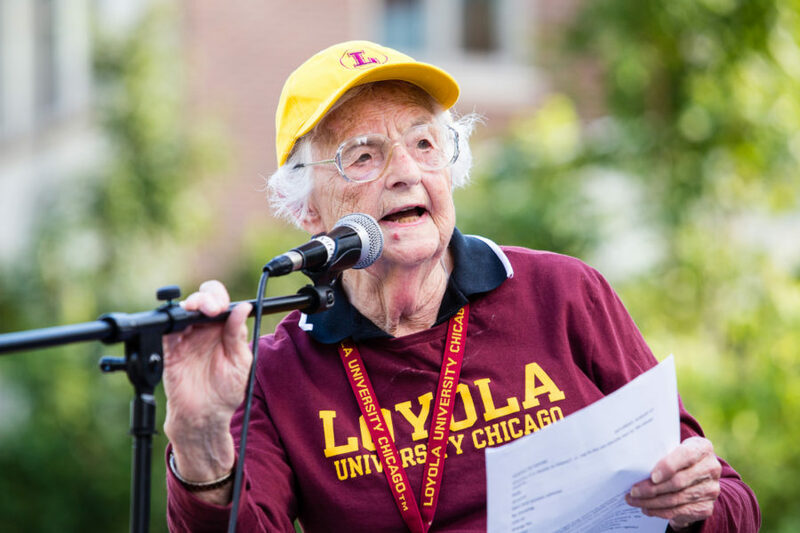 Sister Jean also shared her love for Frank Sinatra’s music, demystified rumors about the Mundelein Center and was inducted into Loyola’s Hall of Fame. 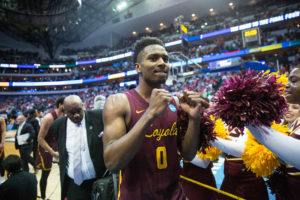 The official NCAA March Madness Twitter account shared multiple photos and GIFs of Sister Jean to recognize the team’s wins. Several national news outlets wrote about her role with Loyola. ESPN, The New York Times and The Chicago Sun-Times wrote profiles on Sister Jean. USA Today shared her advice to the team before they competed against the University of Tennessee Volunteers. A segment aired on ABC World News featuring Sister Jean as part of its #AmericaStrong series — which highlights people who made a positive impact in their communities — and she was a guest on the Chicago-based talk show, Windy City Live. Sister Jean said she likes talking with reporters, and she thinks the attention will benefit Loyola overall. A petition with more than 4,300 signatures is circulating online to have talk show host Ellen DeGeneres bring Sister Jean on The Ellen DeGeneres Show. 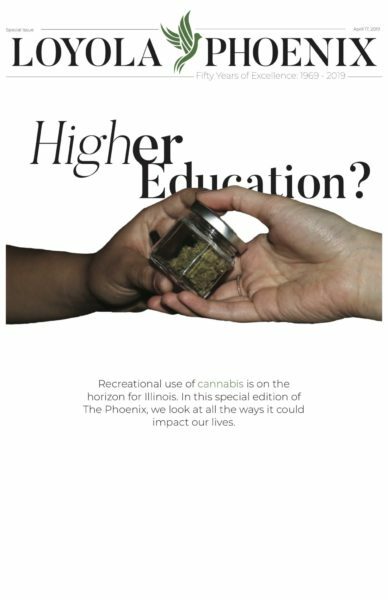 A similar campaign ran in 2013 to have her featured on the show’s “Everyday Heroes” series, The PHOENIX previously reported. Sister Jean said she was open to appearing on the Ellen DeGeneres Show in the article. Ellen DeGeneres did not respond to The PHOENIX’s multiple requests for comment. There are also some parody accounts on Twitter pretending to be Sister Jean. Sister Jean said she does not use any form of social media. “I have so many emails to read every day that if I got a Twitter account I wouldn’t do my work,” she said. And of course, there are memes. Twitter user and Loyola senior Emily Glon tweeted her support for Loyola and Sister Jean Mar. 15 after the team won its game against the University of Miami Hurricanes. me today: I LOVE LOYOLA UNIVERSITY CHICAGO. I BLEED BIOSOAP. I HAVE RAISED SEVERAL LOYOLA BUNNIES AS MY OWN. SR JEAN IS AN ANGEL SENT FROM HEAVEN AND PORTER MOSER IS MY FATHER. GO BLERS 4EVER. Glon, 22, said she likes how friendly Sister Jean is with everyone on campus. “She’s so sweet so it’s nice to see the entire country recognizing that,” the criminology major said. Me when talking about basketball: so proud of MY school, Loyola University of Chicago. ‘Bler nation. Sister Jean for president. Other Twitter users shared photoshopped images of Sister Jean dunking a basketball and as the Fairy Godmother from Cinderella. Jake Neill said he was amazed at how much attention Sister Jean was getting. Meagan Carruth, 18 said she liked seeing Sister Jean featured in national outlets. Laura Sheban, 19, said she thinks Sister Jean’s impact on campus makes her worthy of the recognition.